Wow so much has changed with our renovations since my post 4 weeks ago! It is crazy, I don’t feel like enough is changing to warrant a post per week, but when I look back at the whole month, a whole lot changed. It is funny to watch our thought processes shift and change each week, sometimes each day! When we pulled up the carpets throughout the house we decided the house was no longer suitable for our 2 young daughters to be running around. 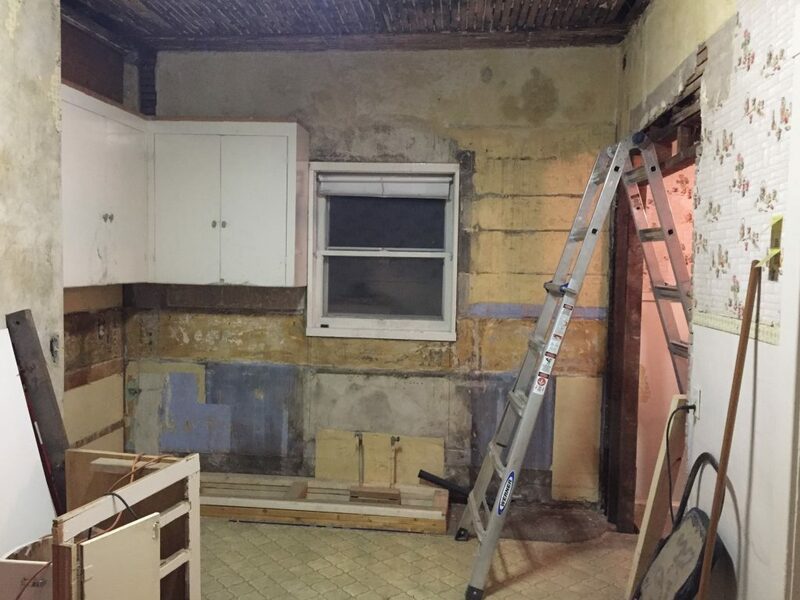 We moved in with my in-laws with the intent on living with them for 2 weeks while we got our floor situation figured out… that has since turned into a couple months while we renovate the entire house. There was no sense in fixing the flooring, and then pulling plaster down, painting, electrical, and insulation on top of our nice new floors. So we are doing that stuff first and then working on the floors. 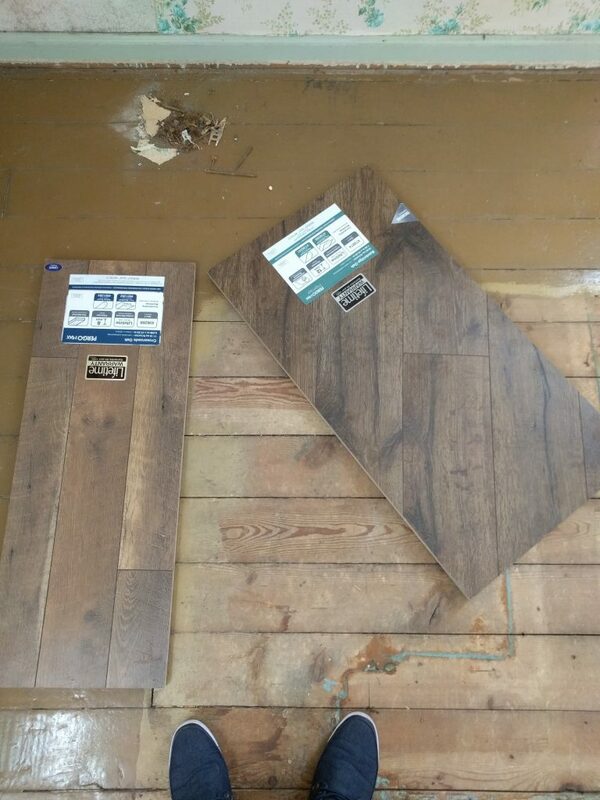 Well here is the floor situation… after lots of studying, and meeting with hardwood flooring experts, we realized that our fir (pine) floors are not hardwoods and are in fact “softwood” floors. 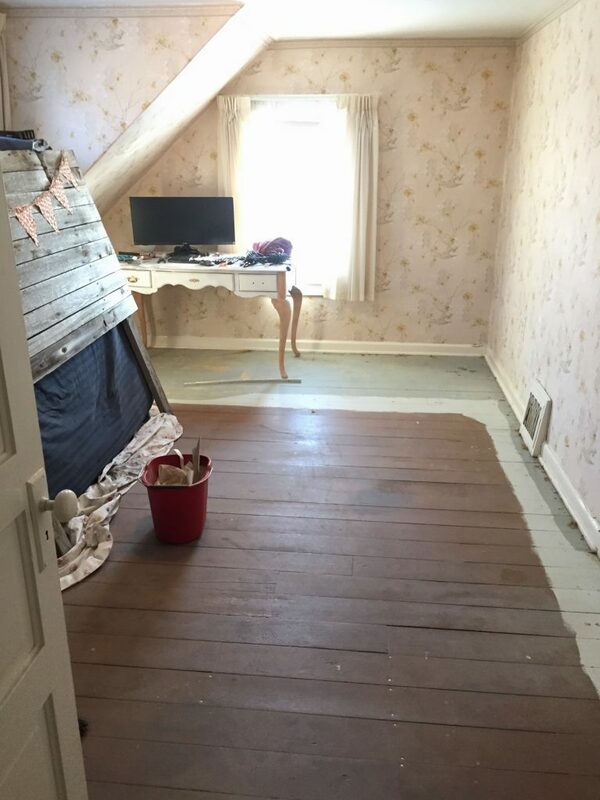 We’ve also read more about old homes and learned that the reason the perimeter of all of the wood floors are painted (actually stained with a color-tinted stain) is because the wood was intended as a subfloor. Carpet was just too expensive to lay throughout the house back then, so they painted the perimeters and laid large rugs in each room. Our biggest concern refinishing our pine floors was that they typically splinter even after they’ve been refinished and sealed. Another problem with our floors is that the gaps between the boards were large, and there were gaps between almost every board that would need to be filled. Oh! And our kitchen flooring had 3 layers of vinyl, the top two layers contained 50% asbestos each! Pulling up that flooring would certainly be dangerous to our health, and hiring out the job would cost thousands. So after much deliberation, we have decided to lay a floating laminate over all the downstairs floors. I love the idea of the floating laminate so that the wood is still preserved underneath. And then we don’t have to deal with the asbestos vinyl. 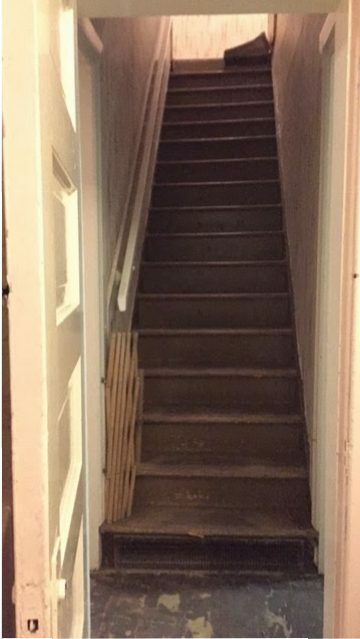 For our stairs, we will paint them white and lay a large runner on them. The runner is necessary because the stair noses are splintering (they are made of pine as well). 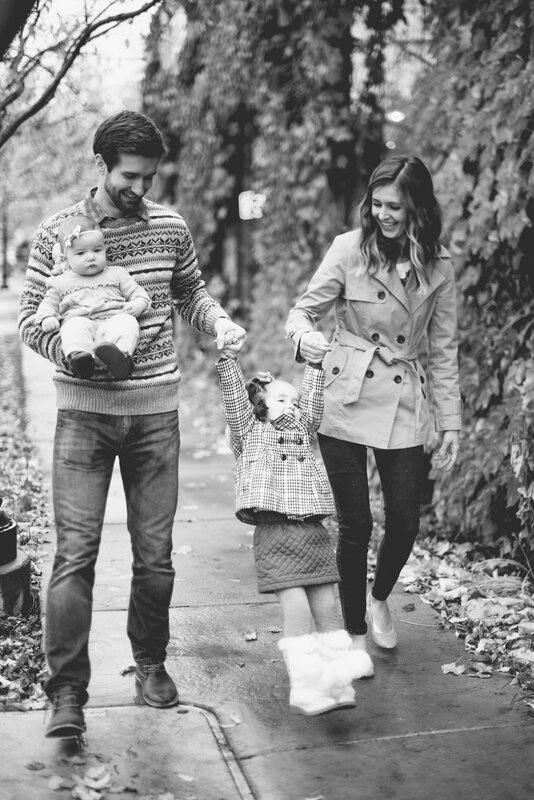 I can’t wait to show you the runners we’ve picked out! For the bedrooms and landing upstairs we have decided to do it as they did in 1916, we are going to paint the floors white (although we will paint the whole floor, not just the perimeter this time) and lay some cushioned rugs down. 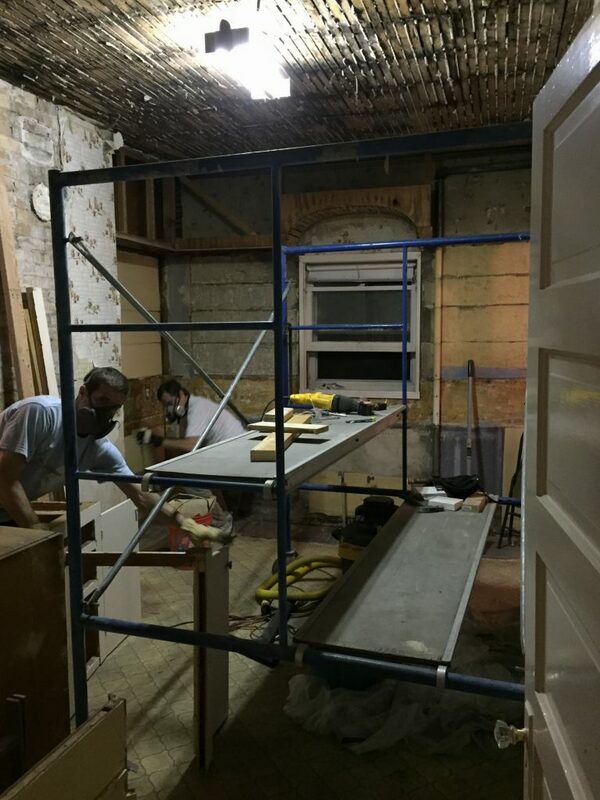 Below is a picture from a few weeks ago when we were pulling down the lath and plaster walls. They were in terrible condition in this room, they felt spongy! 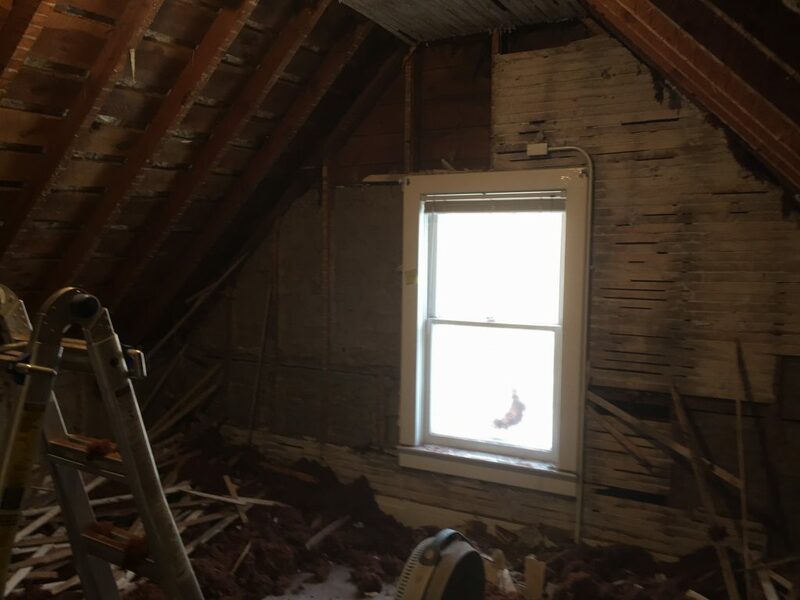 We also needed to add insulation up here so pulling the old walls down was a no-brainer in this room. This week our electrician is coming to redo our entire knob and tube electrical system. We are so excited! Outlets on every wall, how dreamy!! This means I have been shopping for lots of light fixtures! And I still am quite undecided on most of them! For those of you who follow my stories on Instagram, you may have seen our debate over ceiling fans in the attic bedrooms, or the less practical chandelier… since that time we found out that our baby #3 is another girl! With 3 daughters I thought a girly playroom is in order. We will be putting the chandelier in the playroom downstairs, and ceiling fans in the attic bedrooms. Another big hurdle this week is our insulation! We have the insulation guys scheduled as well. Fingers crossed we will have electrical and insulation done by next week! 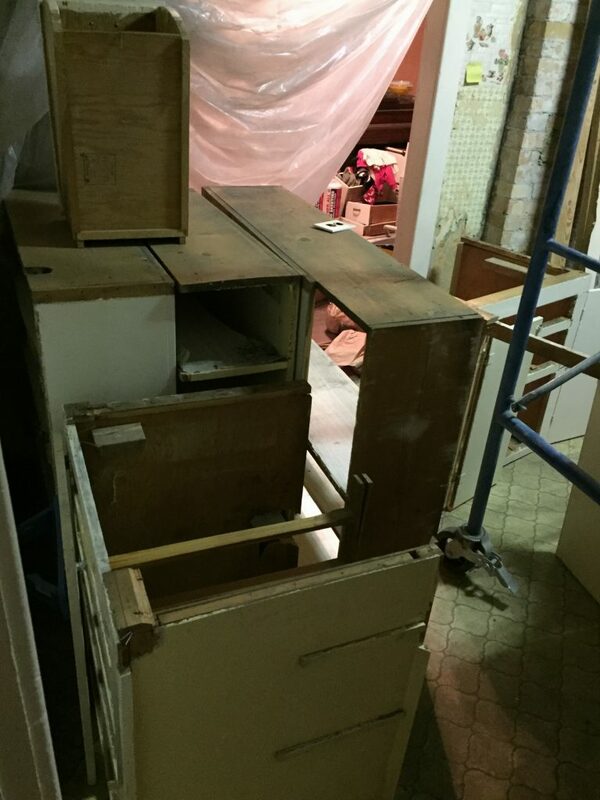 And our kitchen should probably be a post on it’s own, but I will share a quick recap. The kitchen cabinets were darling, and while probably not the “original” (the original was probably a single hutch, no sink, and a wood burning stove) I love them and their quirky drawers, dented faces, and well-loved history. So we have carefully removed them, are making the needed repairs to sure them up, raising them to modern counter and cabinet heights, and using them in our “new kitchen” which will have spaces built for appliances, and a new peninsula in the middle of the room (if you look carefully in the above picture, you can see our sharpie marks on the floor where the peninsula will go). 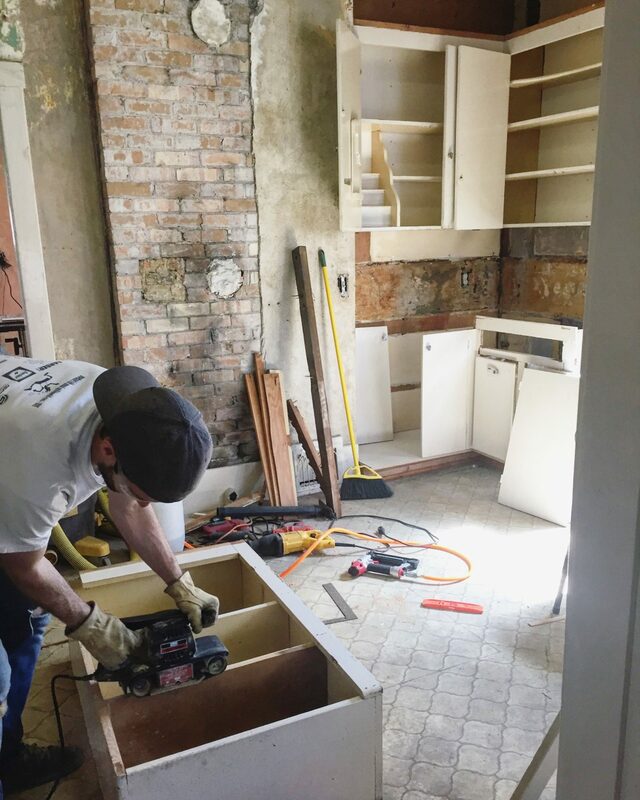 Our poor cabinets all pulled out and needing some love! Phew! Sorry for the long post. I hope I answered some of your questions. If I haven’t answered something, leave me a comment and I will make sure to address it on the next post (or message you back!). Thank you for sticking around during this messy and changing time in our story. It will be so beautiful and worth it in the end.